Prominent particle physicist, professor Rohini Godbole, is a recipient of the Padma Shri this year. The 67-year-old has been a crusader for women in science. On the occasion of National Science Day, which falls on February 28, Godbole says an unconscious bias still exists about women who are in senior positions. Does an unconscious bias exist about women in senior positions in the field of science? It is indeed true that there is an unconscious bias. I am afraid that tackling this issue is neither simple nor straightforward… In India, as far as I can see, there are no specific efforts that have been taken so far… but now, very slowly, the issue is beginning to be recognised. But much more data needs to be collected and analysed to identify clearly the shape that invisible bias takes in India. Studies have shown that family responsibility was among the reasons for loss of trained women power in science. Apart from parental leave, what other measures should be taken to retain them? While family responsibility is one reason that trained women leave science after PhD, lack of social, familial and institutional support structure are equally responsible. In fact, the joint IASc-NIAS survey — ‘Loss of trained scientific women power: what fraction are we losing and why?’ — gave clear evidence of the above statement. If that is so, then measures to stop this drain also have to be more than the ones that have been introduced just now. In the early days, the Department of Science and Technology and Department of Biotechnology introduced programmes for women to come back after a break, which took care, but only as a sticking plaster solution, of this loss of trained human resource… However, there is a need for a comprehensive look at some of the schemes that will hold onto this trained women power. Even measures such as parental leave should be gender neutral…. Till recently, you were the Chair of Women in Science at the Indian Academy of Sciences. What was your experience? I got involved in this whole exercise as a result of my experience of attending the first International Conference of Women in Physics, organised by the IUPAP: International Union of Pure and Applied Physics. Till then, I had not really thought very critically about the situation of women in Physics in particular (and science in general). It is then that I began to reinterpret my own experiences in my early career and realised altogether that one needs to discuss this subject actively. Compared to that time, the awareness has increased. Now, discussions are beginning in India and we need to formulate evidence-based policies, for which we first need to collect adequate data. Most of the early studies of women in science include women in all sciences. Now, there is a subject-specific effort in Mathematics, which is aligned with the international effort on women in Mathematics… for the last few years, even the separate efforts for women in Physics have begun… even then I must say that they are really only just picking up… we still do not have data on women in science, which is subject-segregated. What efforts are being taken to address the issue of gender equity in science? A programme such as Athena Swan in the UK perhaps needs to be put in place in India. In certain universities in the Netherlands, Australia and Germany, there exists ‘Women Only’ permanent positions to address gender equity. Some of the Institutes where I am involved, like IIT-B, are seriously discussing what measures should be put in place… but at present, these are still at the discussion-level. Some efforts are starting… for example, now in leadership training programmes, which are being conducted by MHRD, gender equity is beginning to become an integral part of this programme, as it should be. Any recent data on the number of women in various fields of science? Data began to be collected in a big way at an international level only around 2001. In India, again, the first official report happened in 2005-2006, which was the Indian National Science Academy report on ‘Access of Indian Women to a Career in Science’, after which the DST task force brought out another report…Time is ripe to hold another round of data collection, in fact, at lower levels of important institutes. I am afraid . Positively speaking, in the last 10 years (since the DST Task Force’s second report) a few DST/DBT institutions have had a woman directors..Now the current DBT secretary is a woman (Dr Renu Swaroop). 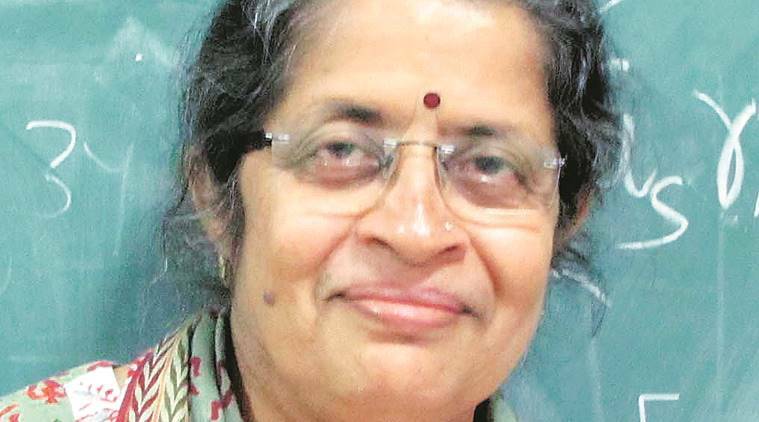 The Indian Statistical Institute director is also a woman, Dr Sanghamitra Bandopadhyaya. An alumnus of S P College in Pune, you are a celebrated teacher and science educator. What is your advice to students and researchers? There is a need to be true to oneself… if you are choosing what to do with your life, listen to your inner voice… you and only you can judge your abilities correctly. Follow your goals, judge what skills you need to achieve them and proceed with full passion. Do not sell yourself short. Innovate and dream, but do so with your feet firmly on the ground!